Launch your Workday tests with a click. Go work on other things. Return to a detailed list of what failed, why, and where. Simple. Expand the breadth, depth, quality, and consistency of your testing with fewer people and in less time. Air-tight testing is hard when it’s not your speciality. So we’ve baked best practices in to Smart—devised by our testing experts and approved by Workday. As an official Workday Select Partner, you can trust that Smart will integrate seamlessly with all of your tenants. Compatibility guaranteed. Our customers rave about our people. From guidance on testing strategy to product set up, training, and post-live support. Our team stays by your side to make sure you’re successful and get the most out of Smart. Offer instant evidence that your Workday business processes, security, and controls are compliant. Auditors love consistent, continuous, impartial testing. When Workday pushes changes live, so do we — so you can be confident that your tests will always run perfectly on the latest version of Workday. All the configuration, BP flow, and integration testing you’d expect from an automated testing solution, plus some extra special features. Run high-volume, consistent and reusable tests that match your unique Workday configuration with just a click. Troubleshoot tests failures at a glance with screenshots that show you exactly which screen it failed on and the Workday error message it triggered. Most BPs aren’t used in isolation, so don’t test them that way. Whether it’s hire-to-fire or the procurement lifecycle, you can test a series of related processes with ease. Safeguard personal data and the integrity of process controls by checking that users can’t see or do anything they shouldn’t, right down to related actions and field level permissions. Watch the webinar. Continuously verify that costs are being routed to the right ledgers to spare your financial team the agony of backtracking and correcting mistakes. Retrieve every test ever run with details on who ran it, when and what the result was OR make your auditors read-only users so they can gather evidence themselves. 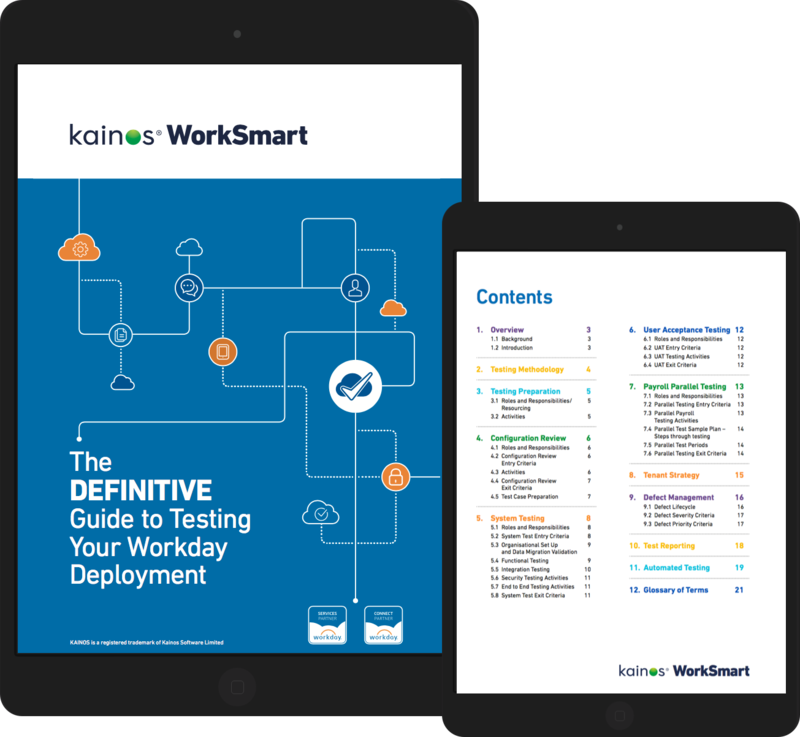 Bolster your staff’s knowledge and skills with this 21-page guide to Workday testing. When you buy a subscription for Kainos Smart, we build your test packs to match your unique configuration of Workday. For this reason, pricing varies. But here’s some of what you can expect out of the box. See for yourself what Smart can do for you. Tell us the challenges you’re having with Workday testing, and we’ll prepare a live demo to show you how Smart’s automation can help your team overcome these.